‘Tis the time of year when many Calgarians bolt for places where snow is but a granular substance found inside a glass globe. But we Johnsons prefer to stay put, refusing to miss even a flake of the white stuff, unable to skip one of the two hundred and ten days of winter each year. We’re pioneers, really. Except, instead of chopping wood and salting meat, we rely on sugar, Netflix and Calgary Public Library to get us through the worst of it. Afraid I was going to miss something extraordinary, I started watching it on Netflix. Around episode 3, the professor joined me and we watched the remaining four episodes ensemble. How to sum up the experience? Something along the lines of: the touristic antidote to Lord of the Rings. You know how people watch the Lord of the Rings trilogy (well, ‘people’ other than moi) and then all they want to do is visit New Zealand? Is there great cinematography? Yes. Is there an unending sense of dread that pervades all seven episodes? Yes. Were the actors believable (i.e. scary and causing me to vow never to visit that beautiful land), um, yes. I hesitate to admit – on a public forum, no less – that I watched this movie, but I did. Sometimes you find yourself at the library in front of the ‘check this out’ DVD rack and you settle for what looks like the best of the worst options. Cirque du Soleil? Or The Hot Flashes? The Hot Flashes. And then you watch the movie at home while your husband makes fun of you the whole time. What’s not to love? It’s a movie about women of a ‘certain age’ playing basketball to raise money for a mobile mammogram unit. And it has Daryl Hannah, Camryn Mannheim (when was the last time they were in anything), Brooke Shields and Wanda Sykes. And their coach is a little person. As the professor sighed and rolled his eyes, I consulted my movie-bible, rottentomatoes, to see what I should think of The Hot Flashes. ‘Thirty six percent of people agreed this is a good movie,’ I reported triumphantly. And there’s a one in three chance you’ll be one of them. Speaking of blogs and ‘you should watch (or read) this’ recommendations, I read a review by a blogger that said Meg Wolitzer’s ‘The Interestings’ was hands-down the best book she read in 2012. For an underwhelmed person, who can never decide if a book should get 3-stars or 4 (never mind 5), these were powerful words. The best book? Of all the books read in an entire year? So I reserved it at the library and waited, almost a year, to get it. And then I started reading it. But I couldn’t get into it, preferring sleep over late nights reading about adolescents at a summer arts camp. But then I felt guilty – here I had, in my possession, the best book of 2012 and I wasn’t even going to read it?! And then, on a subsequent visit to the aforementioned blog, I realized that this reviewer and I have slightly divergent tastes. Or maybe it’s just that hers is more effusive. And then I got annoyed that this person I don’t even know had hijacked my free-time and guilted me into reading a book I didn’t entirely want to read. But it was 480 pages…..which took a while to finish. And then, finally, it was over. In the years before we had children, the professor and I used to watch Malcolm in the Middle. I loved it the same way I loved Roseanne. Lois, yelling her head off, being all crazy and Hal being his Bryan-Cranston-best. Entertainment gold. Over the break, the professor streamed the pilot episode on Netflix, and we sat back with our own three boys and watched. It was a bit of a (frightening) revelation – the crazy mother, the messy house, the boys doing things that defy logic (or gravity). It was less entertainment and more ‘thisismylife’. The boys, of course, loved it and laughed their little heads off. Speaking of boys laughing, after months of hemming and hawing, we purchased a juicer. The professor had seen Fat, Sick and Nearly Dead and became a convert to the idea and I, having parted with lots of cash for a freshly squeezed beet-carrot-orange-mango juice at the farmers market, concurred. So I spent weeks reading reviews and trying to decipher words like centrifugal and masticating, putting juicers in a virtual cart on Amazon and never buying them. Finally, Costco forced my hand, when I saw a similar juicer near the Skylander Giants display. I put it in my metal cart and pushed it through the checkout. And then with a minimal skim of the instructions, I summoned the boys, who watched eagerly while I cut up beets, carrots, orange and lemon and dropped it in the chute. They were especially delighted by the pulp discarded through an intestinal tube on the side of the machine. Veggie-poop! Ha ha ha. 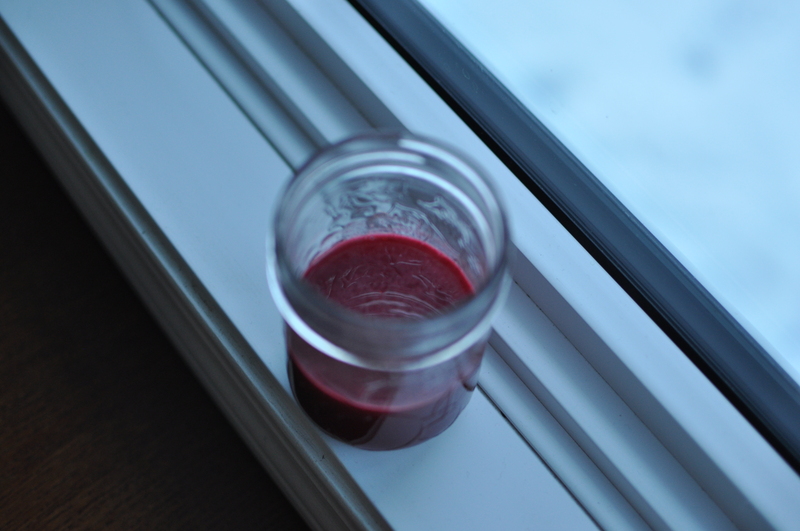 It was so fun and exciting we immediately made another batch consisting of celery, apple and raspberry. It proved to be very educational: a little celery goes a long way. Yikes. ‘Let’s make another one,’ I carpe’d the diem and threw in some kale, lemon, apple and whatever else was left. It, too, proved educational: ‘my belly hurts,’ the Hen announced immediately afterward. Turns out, there is such a thing as too much juice. For more dubious reviews or to make fun of my taste, check out this page which I update (very) periodically.